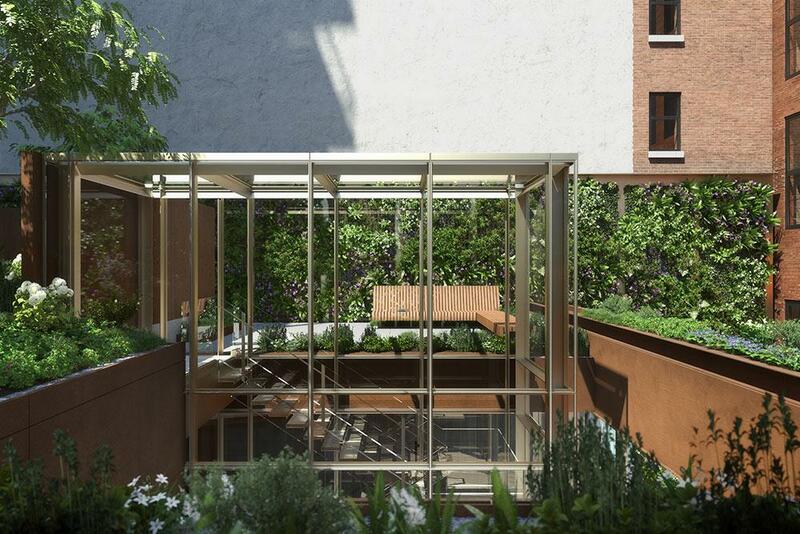 A collection of 16 artfully crafted two- to four-bedroom residences, designed by renowned architecture firm BKSK, 1 Great Jones Alley takes its visual cues from elements that have for a century distinguished this iconic neighborhood: a terracotta façade, a cobblestone alley, Corten steel walls with an elegant patina, and a secret garden oasis. 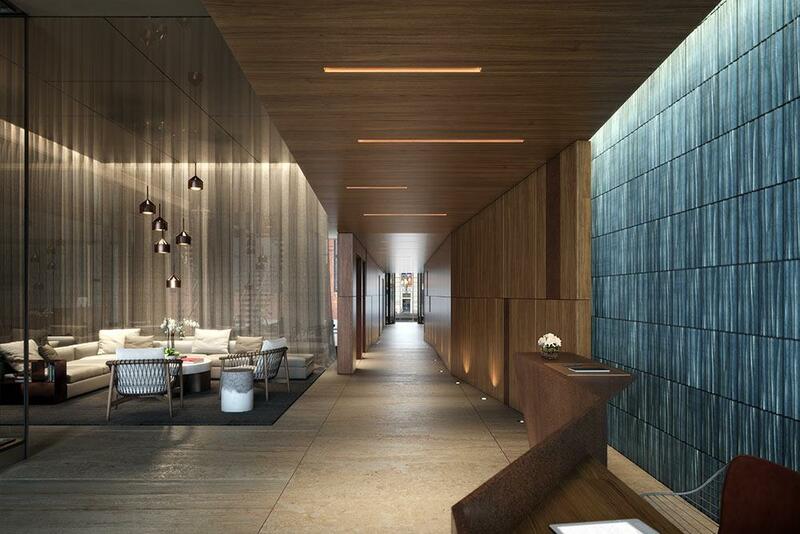 The Penthouse at 1 Great Jones Alley is truly the new standard of design and luxury in NoHo. 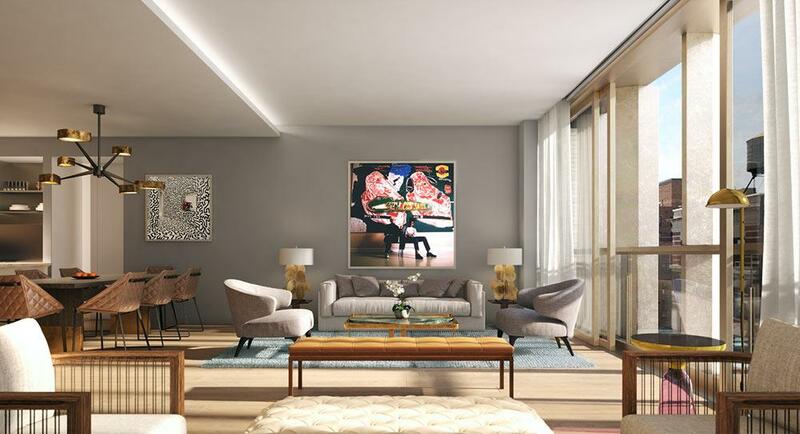 This grand, spacious, and light-filled duplex penthouse features 5,596 internal square feet and over 1,000 external square feet, over three terraces, offering majestic panoramic views of Manhattan. Comprised of four-bedrooms, five full baths and two half baths, the penthouse offers two distinctive levels for living and entertaining. With privacy in mind, two keyed elevators allow for access to both the 11th and 12th floors for you, your guests, and staff. The first floor of the penthouse houses the bedrooms, and features a media room with wet bar. 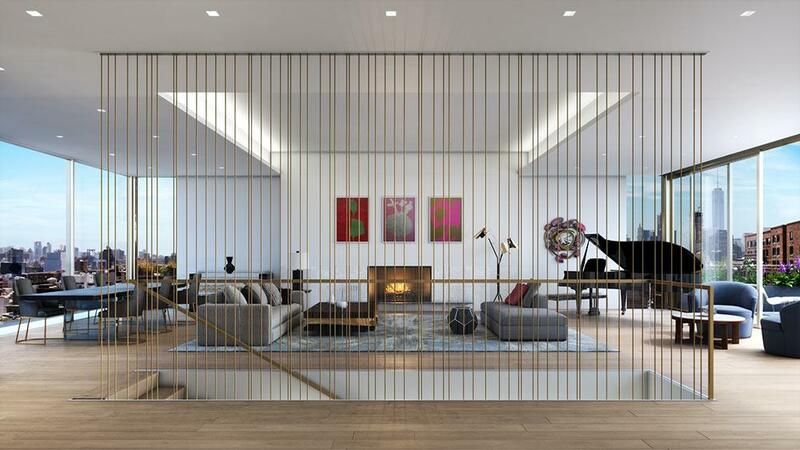 The second floor is thoughtfully designed for spacious entertaining opening onto an expansive great room and loft-inspired space featuring over 12 foot ceilings, fine custom millwork, 7 inch wide-plank European oak hardwood flooring throughout, custom E.R. 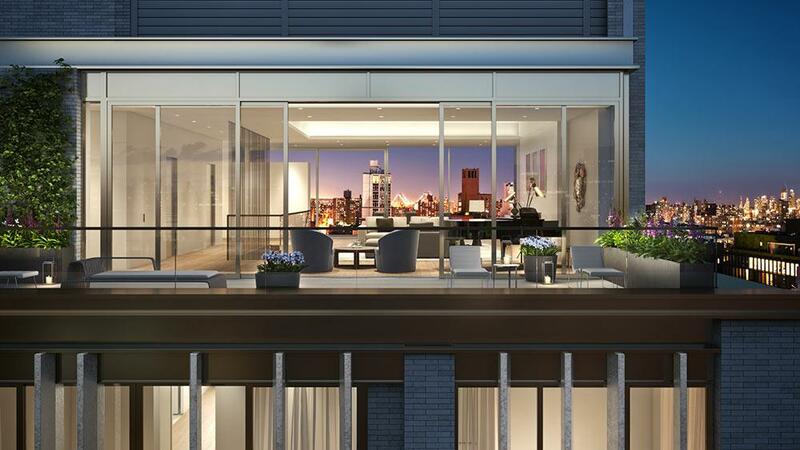 Butler & Co door hardware, and floor-to-ceiling glass doors that open onto a terrace to the west, as well as a gracious balcony to the east off of the dining room, allowing you and your guests wonderful light and air from any vantage point. 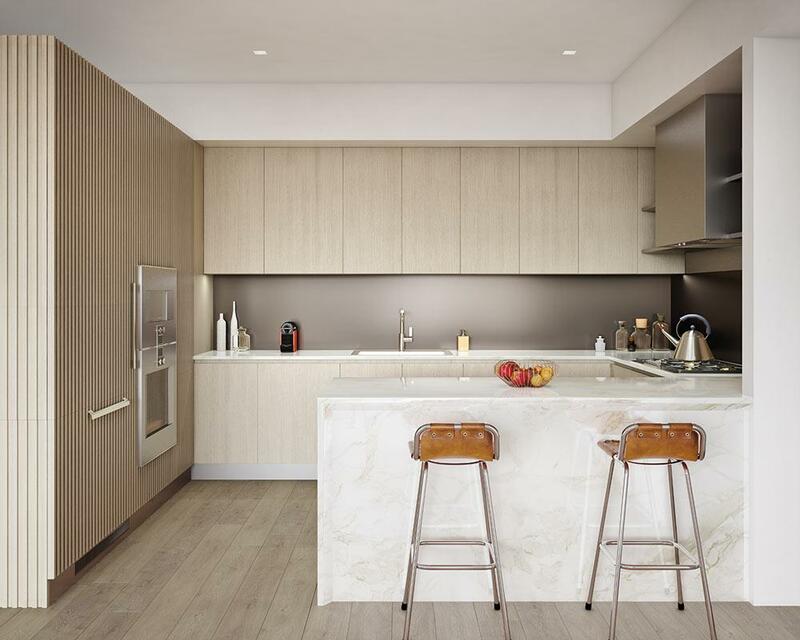 The kitchens at 1 Great Jones Alley are custom designed by BKSK for Arclinea and feature Italian white oak cabinetry in vertical stave and flat-panel finishes with stainless steel accents, Calacatta marble countertops with waterfall and knife-edge detailing at the peninsula, a stainless steel sink basin by Blanco featuring a Dornbracht faucet, and a custom back-painted statin-etched tempered glass backslash. The all Gaggenau appliance package includes a five-burner gas cooktop, stainless steel double wall oven with combination steam oven, panelized refrigerator and freezer, under-cabinet wine refrigerator and panelized dishwasher. This residence offers a side-by-side vented gas washer and dryer, and separate service entrance. The penthouse master suite offers a gracious layout with a study that opens onto a private balcony, multiple walk-in closets and two, spa-inspired en-suite master baths. The exceptional master bath finishes include quartzite slab floors, walls and countertop, a custom double vanity of quartzite with teak accents and integrated lighting, a custom glass, full-height steam rain shower and soaking tub with quartzite walls and teak surround, private water closet with Laufen ceramic wall-hung toilet, and Cyprum Dornbracht fixtures throughout. 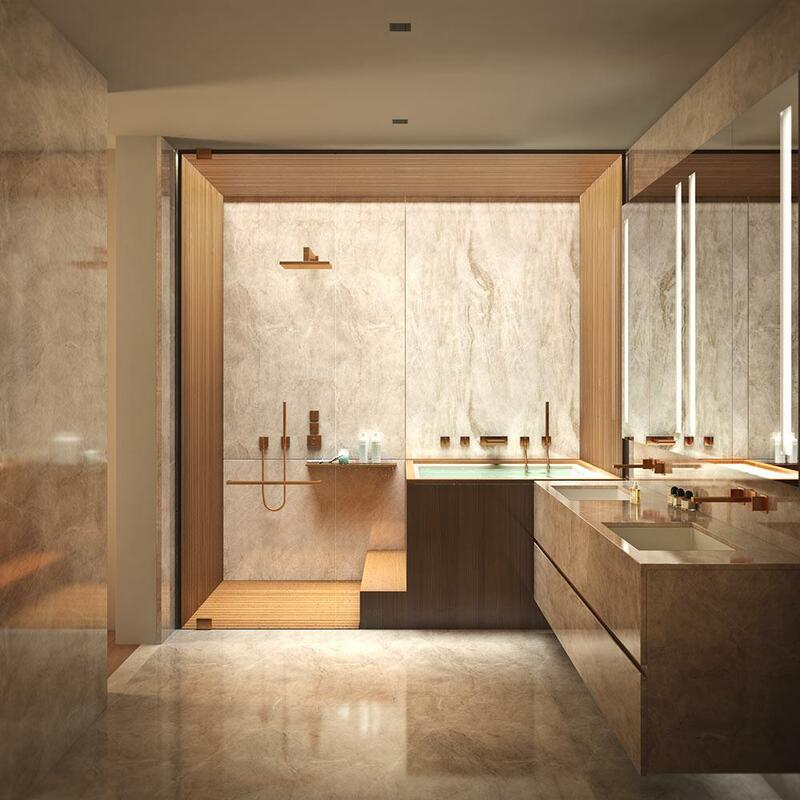 Secondary bathrooms feature Tundra Grey honed marble walls and flooring, custom teak vanities and recessed medicine cabinets with integrated lighting, teak accent walls in the showers, ceramic wall hung toilets, and Dornbracht fixtures throughout. 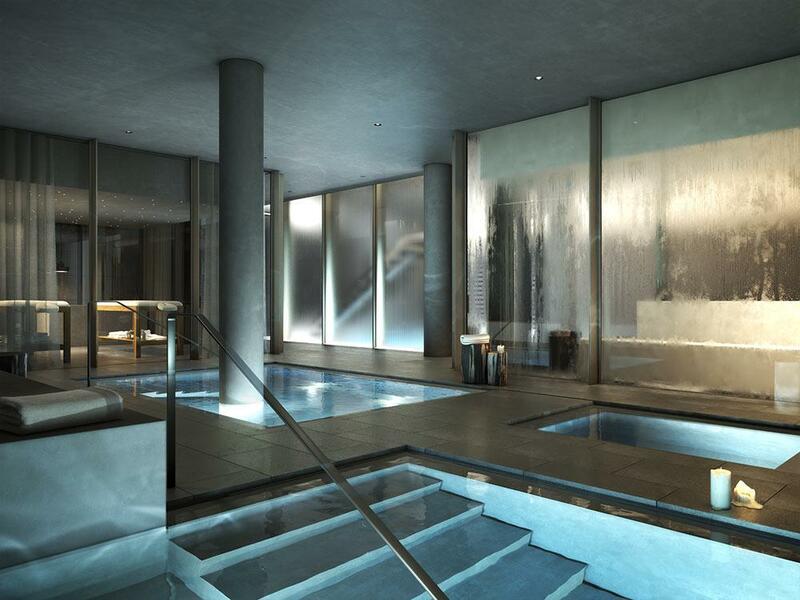 Spa- and wellness-inspired amenities include a state-of-the-art fitness center by Jay Wright of The Wright Fit, a serene water spa featuring three thermal baths of varying temperatures, a windowed steam room and a private treatment room. 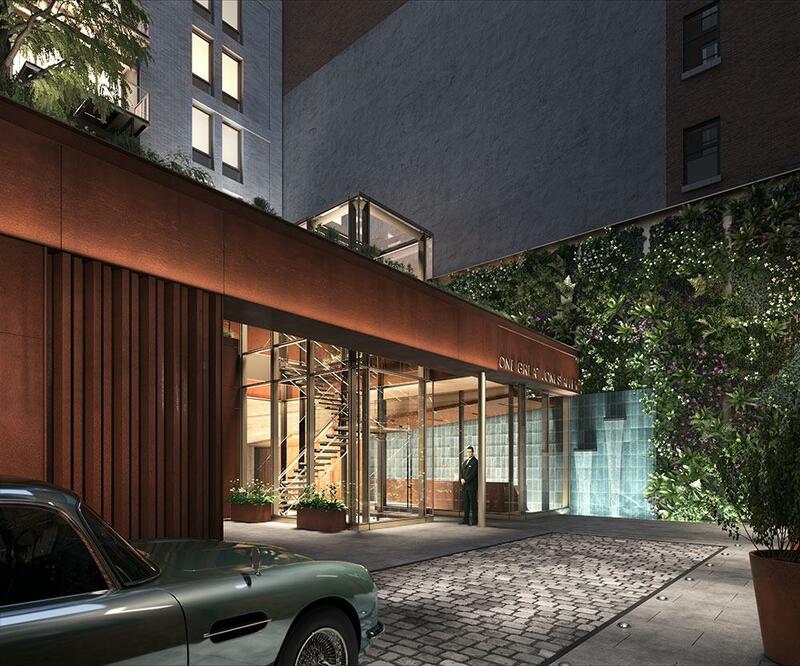 Additional amenities include a lushly landscaped second-floor roof terrace designed by HMWhite, and an exclusive private alley for convenient and secure pick-up and drop-off.